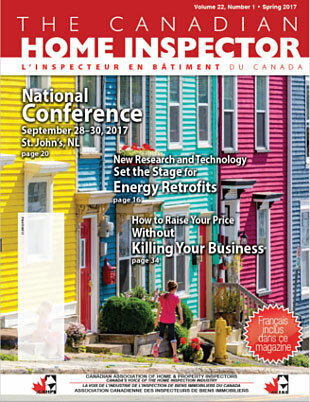 The Canadian Home Inspector is published bi-annually and includes important information on the home inspection profession from the undisputed leader of the profession, the Canadian Association of Home & Property Inspectors. The purpose of this magazine is to provide a source of information on all that is new and newsworthy in the home inspection industry for the benefit of CAHPI members. All CAHPI members receive The Canadian Home Inspector as part of their membership benefits. The magazine archive is available on the Members Online Technical Library. The digital issues are in a dynmatic electronic format which include URL hyperlinks.